Source: Lady Alice Bertha Gomme, A Dictionary of British Folk-Lore, Volume 2 of 2, George Laurence Gomme, ed. (London: David Nutt, 1894, 1898), pages 315-321. Alice Bertha Gomme, Lady Gomme, born Merck (4 January 1853, London - 5 January 1938, London) was a leading British folklorist. Two turtle doves and a partridge in a pear-tree. Two turtle doves, and a partridge in a pear-tree. 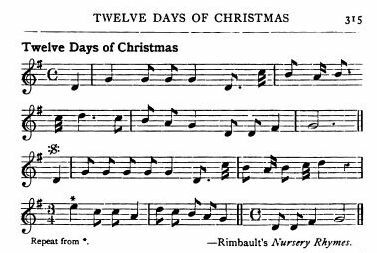 In the Second Edition (1843), "The First Day of Christmas" was rhyme # CCLXXII, and occurred on pp. 155-156. In the Fifth Edition (1886), it was rhyme # CCCXLVI, occurring on pages 184-188. Three stalks o' merry corn, three maids a-merry dancing. — Chambers's Pop. Rhymes, p. 42. Twelve triumphant trumpeters triumphantly trumpeting the tragical tradition of Telemachus. Hunting over other men's grounds! I wish them all safe home again. I do not know and I do not care. With a gaping wide-mouthed waddling frog. —Halliwell's Nursery Rhymes, cclxxx., cvi. (c) "The Twelve Days" was a Christmas game. It was a customary thing in a friend's house to play "The Twelve Days," or "My Lady's Lap Dog," every Twelfth Day night. The party was usually a mixed gathering of juveniles and adults, mostly relatives, and before supper—that is, before eating mince pies and twelfth cake—this game and the cushion dance were played, and the forfeits consequent upon them always cried. The company were all seated round the room. The leader of the game commenced by saying the first line. Generally the version used was similar to No. I. In later years the shorter version, No. III., was said. The lines for the "first day" of Christmas was said by each of the company in turn; then the first "day" was repeated, with the addition of the "second" by the leader, and then this was said all round the circle in turn. This was continued until the lines for the "twelve days" were said by every player. For every mistake a forfeit—a small article belonging to the person—had to be given up. These forfeits were afterwards "cried " in the usual way, and were not returned to the owner until they had been redeemed by the penalty inflicted being performed. In version No. IV., the game began by the leader saying to the player sitting next to her, "Take this!" holding the hands as if giving something. The neighbour answered, "What's this?" The leader answered, "A gaping, widemouthed, waddling frog." The second player then turned to the third and repeated, "A gaping, wide-mouthed, waddling frog," and so on all round the room. The leader then said, "Two pudding-ends would choke a dog," continuing in the same way until twelve was reached. Chambers does not describe the way the game given by him was played, but it was probably much in the same manner. Rimbault's Nursery Rhymes gives the tune to which words of the song were repeated. The words given are almost identical with No. I., but the tune, copied here, is the only recorded one I have found. (d) It seems probable that we have in these rhymes a remnant of a practice of singing or chanting carols or rhymes relating to the custom of sending gifts to friends and relatives during the twelve days of Christmas. The festival of the twelve days was an important one. The great mid-winter feast of Yule consisted of twelve days, and from the events occurring during those days it is probable that events of the future twelve months were foretold. — On the festival of the twelve days consult Keary's Outlines of Primitive Belief, p. 381. Miss Burne records that the twelve days rule the year's weather; as the weather is on each day of the twelve, so will it be in the corresponding month, and for every mincepie eaten in friends' houses during these days a happy month is promised. In the games usually played at this season, viz., those in which forfeits are incurred, and the redemption of these by penances inflicted on the unhappy perpetrators of mistakes, we may perhaps see a relic of the observance of certain customs and ceremonies, and the penalties likely to be incurred by those persons who omitted to religiously carry them out. It is considered unlucky in the North of England and Scotland to enter a neighbour's house empty-handed. Christmas bounties, and the practice of giving presents of food and corn and meal on St. Thomas's Day, 21st December, to the poorer people, when they used to go round to the farmers' houses to collect food to prepare for this festival, may have had its origin in the idea that nothing could be prepared or cooked during the festival of the twelve days. It was a very general practice for work of all kinds to be put entirely aside before Christmas and not resumed until after Twelfth Day. Dr. Gregor records that no bread should be baked nor washing done during this period, nor work left unfinished. Jamieson, in a note on Yule, says that the gifts now generally conferred at the New Year seem to have originally belonged to Yule. Among the northern nations it was customary for subjects at this season to present gifts to their sovereign,—these were called Jolagiafir, i.e. Yule gifts. The custom in Scotland of presenting what we vulgarly call a sweetie-skon, or a loaf enriched with raisins and currants, has an analogy to this. It is difficult, with the scanty evidence at command, to do more than make the simple suggestions above. The game is evidently in a process of very rapid decadence, and we have probably only poor specimens of what was originally the form of verses sung in the two versions from Halliwell and Chambers. The London version, No. III., is only recognisable as belonging to this game from the fact that it was known as playing at the "twelve days," was always played on Twelfth Day, and it was not considered proper nor polite for the guests to depart until this had been played. This fact has induced me to add the fourth version from Halliwell, because it appears to me that it may belong to the final form which this game is taking, or has taken, namely, a mere collection of alliterative nursery words, or rhymes, to puzzle the speaker under a rapid repetition, and to exact forfeits for the mistakes made.